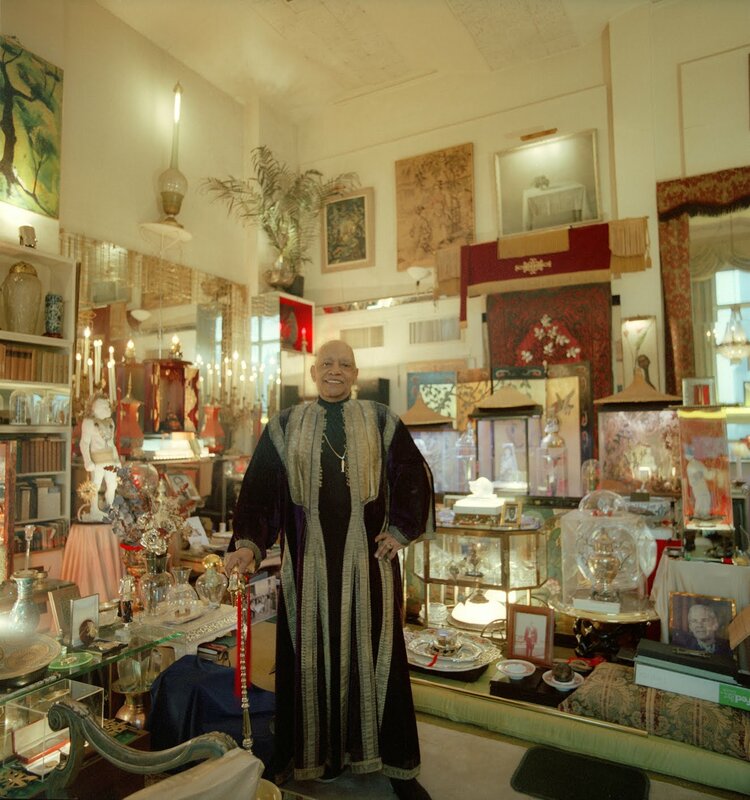 For 22 years, Josef Astor lived in Studio 845, a triplex in the Carnegie Hall towers, long the home of a fascinating segment of New York's Bohemia. A fine art and portrait photographer (check out his mannequin photos), he is also a filmmaker, and his documentary Lost Bohemia will be showing November 5 and 8 at the DOCNYC film festival. Since being evicted from the Carnegie Studios, Mr. Astor remains in limbo, in a temporary sublet with his photo studio in storage. I interviewed him via email about his movie and his life above Carnegie Hall. Q: Many New Yorkers have been fascinated by the story of the Carnegie Hall towers and the recent ousting of its resident artists. It seemed like a separate world, an old New York preserved in amber. What of this world will we find in your film? 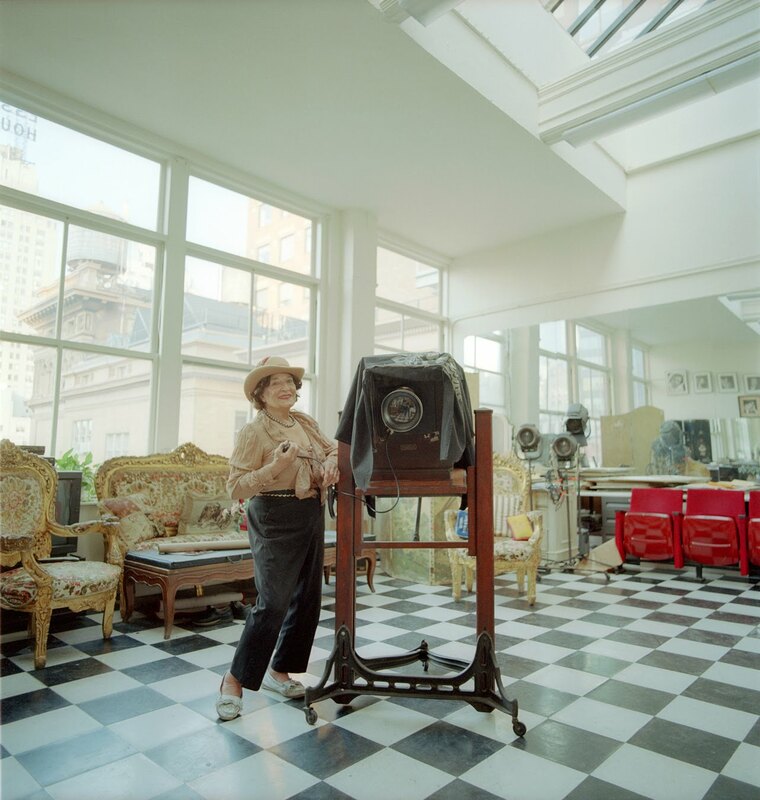 A: I was one of the newer tenants, moving there in 1985, so at the outset I was trying to capture some of the original buzzing artists colony feeling as it was described to me by the older tenants. What we see in the film is a sort of call to arms. As the tenants and their lives there became threatened, more and more of them crept out of the woodwork to support the cause. Some of them hadn't been seen in years. One very reclusive poet gave her insights and support through a barrage of phone messages. The place still had a vitality, and wasn't just an enclave of musty dusty old timers that the press lead the world to believe. In the film you will meet Dr. Donald Shirley, concert pianist; Editta Sherman, photographer, a.k.a. "The Dutchess of Carnegie Hall"; Robert Modica, acting coach and his student John Turturro; Bill Cunningham, New York Times photographer; Star, a homeless aging dancer who still exercises in the fire stairwells; and many others. Q: You came to New York City from Ohio, which you've said was an "uninteresting" place. What did you come seeking in the city? In what way did you find it at the Carnegie Hall towers? A: The mere fact that they do polls in Ohio to find the median American way of thinking told me I had to get out and fast. Growing up, I was told that I looked like I belonged somewhere else. Well, lucky for me, I found that somewhere else. 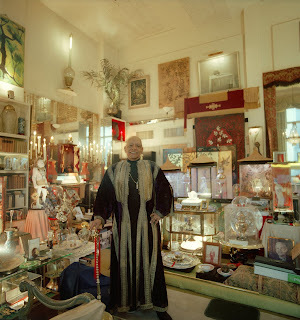 The biggest personal revelation from my time in the Carnegie Studios was finding kindred spirits in the community of artists and realizing all at once: I am them, I am home! Q: I often worry that the city is becoming just as uninteresting as Ohio, inasmuch as "Ohio" is a stand-in metaphor for Heartland America, and that the eviction of Carnegie's artists, like the evictions at the Breslin, is a sign of the city's war on its once-celebrated bohemian culture. Do I worry too much? A: Not enough people worry about this. But I think it is less a matter of public apathy than the city's corporate real estate-friendly administration. One older tenant remarked, "If Fiorello Laguardia was the mayor, you would have your Carnegie Studios." The Plaza Hotel is a perfect example of why Landmarking should consider the purpose and heritage of the building and not just its shell. The Plaza Hotel has lost its soul, and so will the Carnegie Studio Towers. The Carnegie Hall building is owned by the City of New York and leased to the Carnegie Hall Corporation, but there was never a public hearing. Dan Garodnick, our local City Councilman and preservationist, was given a tour of the studios, but nonetheless voted in favor of the plan to destroy them. Off camera, the voice of a reclusive tenant in the film says, "We have a great machine working against us…it's full of lies...and lack of history." Q: Some argue that the evictions of a few rent-regulated tenants will benefit the broader city because Carnegie Hall is using the space for expanded music education. How do you respond to this viewpoint? A: I suppose “viewpoint” is the operative word here. This idea, like that of eminent domain, is flawed and misguided. The greater good is not necessarily greater than what would manifest from benefiting the lesser ones. To the tenants who know what the studios really are and were meant to be, it is clearly corporate spin. Since their inception in 1895, the city always benefited greatly from the diversity of the arts in the studios, the larger percentage of them being devoted to education. The 1935 book The House that Music Built states that Carnegie Hall was primarily an education institution, even though it had an entertainment department, and continues on to list all the diverse teaching institutions in the studios. 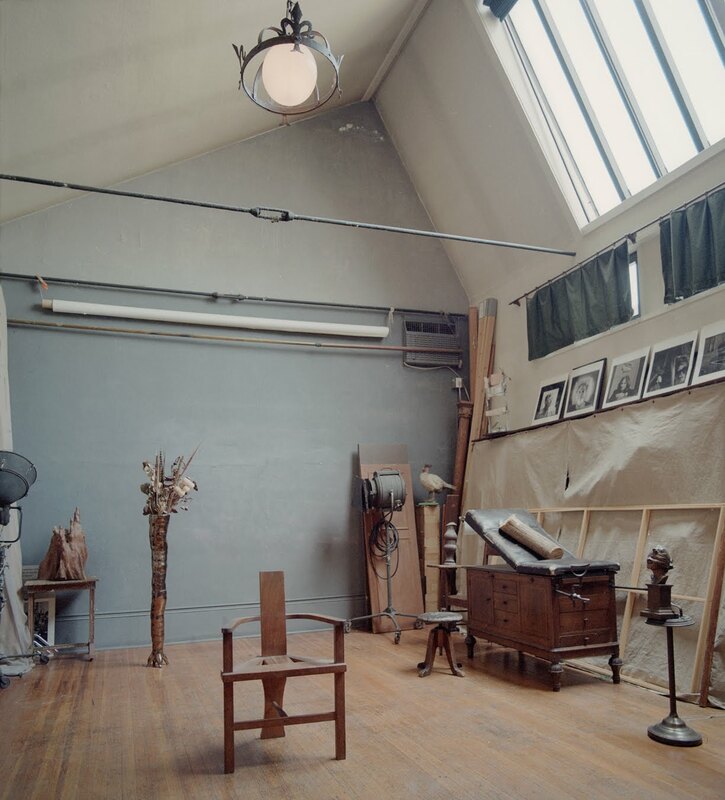 The teaching studios have greatly diminished, not due to any natural evolution, but by an effort of the CHC to purge the artists from the building and repossess their spaces. To convert the studios into a single use of music is in denial of their original purpose. 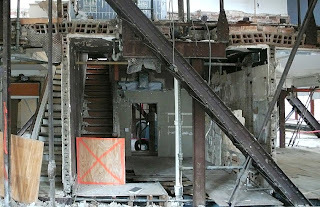 The Carnegie Hall Corporation has never really made public their plans for the 160,000 square feet of studio space, but we hear that the entire 8th floor, where my studio was, and which had the most magnificent 20-foot vaulted ceilings and skylights, will be a sea of contemporary office space, and the rooftop skylights will be razed and replaced by a terrace for the exclusive use of the Corporation and fundraising. Q: Editta Sherman was the poster child (or poster elder, at 98 years old!) for the Carnegie artists' cause. A staunch holdout, she was the last resident to be relocated. How is she doing these days? A: I see Editta often and she is an indomitable spirit to be sure, but I can see that part of that spirit has been crushed. She is not happy in the fancy high-rise building she was moved into. Her true bohemian spirit hasn't adjusted to the bourgeois comforts of domestic living. "Where's my studio?!" she says to me. Q: What do you miss most about your life atop Carnegie Hall? A: It was something intangible. All the studio tenants talked about it, but it could never be accurately described. A spirit of community and reclusiveness existed simultaneously and was respected by your neighbors. We were insulated and protected there, even though it was located in real-estate-mad Midtown. The broad diversity of lifestyles and art forms of the artists were given a nurturing framework by the inspired architecture. You simply had to be there to feel it. And I knew that this was the one thing I might not be able to capture on film, but I lived it and spent 10 years filming it so that others may at least get an impression of what it felt like to work and live in the towers above Carnegie Hall. See the movie November 5 and 8--click for tickets. Unbelievable... that's all I can say. 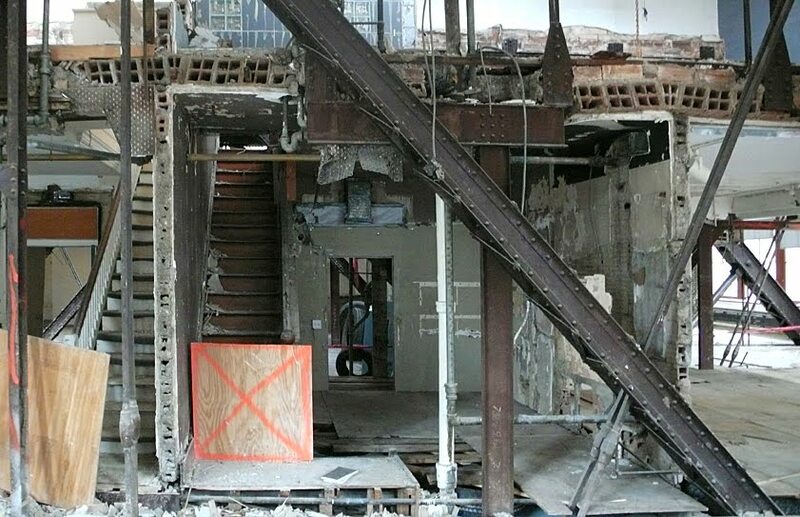 The photo of the demolition of Astor's studio is a war photo. Destruction of art and culture. The Carnegie Foundation has essentially wiped out an indigenous culture and replaced it with office cubicles. Without this film, there would be no chronicle of the beauty and art in the artists' residences of Carnegie Hall. I grew up next door to Carnegie Hall and my best friend in my building studied ballet there when we were kids. Then, after college, I studied, along with many others, with Norman Raeben, an amazing artist and teacher, who had a painting studio in the tower. It was the most influential part of my entire education. (Bob Dylan also studied with Norman). The light in the studio contributed to so many of the lessons. Apparently, no lesson was learnt from the destruction of the old Penn Station, replaced by an uncharacteristic mall, while it's original marble sculptures were sent to a swamp in New Jersey. Isn't it possible to think of the living heritage that occupied the studios? penn station replaced by a mall? did i read that comment right? if so im not ever coming back. & that roof for carnegie hall is so ugly. I spent a year in a relationship with a photographer who had a studio on the fabulous 8th floor. For years I spoke to friends about how SOMEONE should make a film about the hidden, absurd and wonderful goings on above Carnegie Hall. Unfortunately the film comes now, but about the demise of those utterly unique spaces at the hands of money grubbing philistines. Clive Gillinson is not an American and has no stake in preserving our heritage.A disgrace against art and culture, our city, our Mayor who refused to get involved. I felt sick inside watching the film, to witness what has been done, to feel and know what is lost forever. Saw a screening of the film Lost Bohemia this week, in a beautifully restored theater, with an organ like the one demolished in the film. 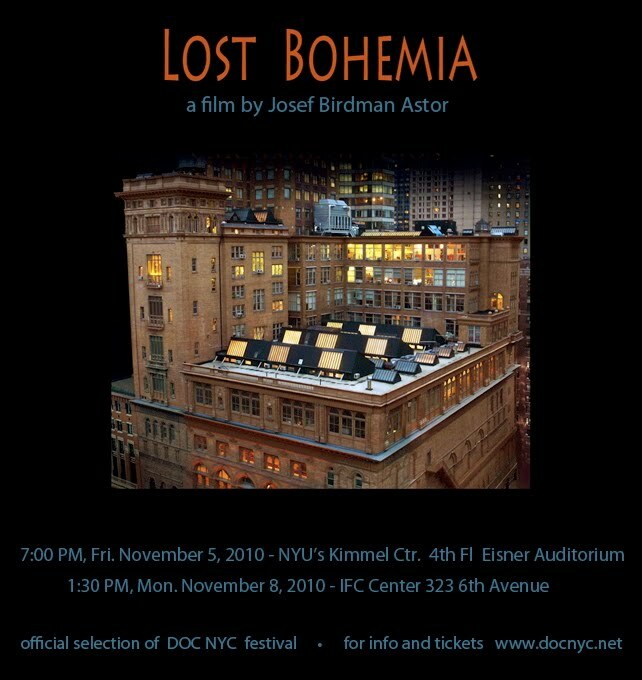 Hit the LostBohemia website, watch the trailers, look at the photos, then pull out the credit card and get the film. For very little money you can support the effort to at least make people aware of this once magical place. It was magical, I remember wandering up and down staircases, hearing dance shoes, metronomes, laughter, singing, all sorts of instruments being played with passion and talent, the smell of paint--it was a delicious den of the arts. And yes, how can we monetize this useless space I'm sure was the soulless question that began the destruction. Now the elite will be rewarded by visiting alone, no community of creativity. Bah. Where can we buy the movie?--Thanks!